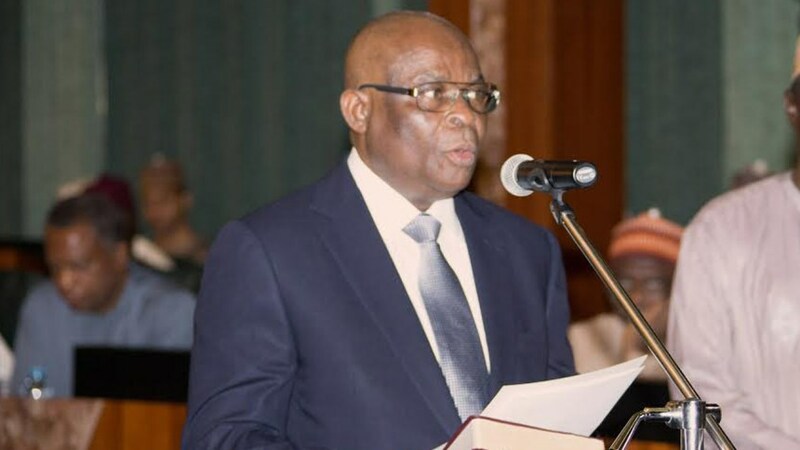 Members of the Code of Conduct Tribunal, CCT, were on Tuesday, over an application that sought to suspend further proceedings in the six count charge the Federal Government preferred against the Chief Justice of Nigeria, CJN, Justice Walter Onnoghen. The chairman of the three-member tribunal, Mr. Danladi Umar had relied on section 306 of the Administration of Criminal Justice Act, 2015, to reject a motion the CJN filed for his trial to be adjourned sine-die (indefinitely) to await the outcome of a suit he lodged before the Abuja Division of the Court of Appeal. Another member of the panel, Mr. William Agwadza Atedze, relied on section 287(3) of the 1999 Constitution, as amended, and plethora of Supreme Court decided cases, to insist that the CCT was under obligation to respect four different interim injunctions that restrained all the parties, including the tribunal, from taking further steps in the matter. The CJN, who for the second time, failed to appear before the CCT to be arraigned on allegation that he failed to declare his assets, as well as maintained domiciliary foreign bank accounts, had through his team of over 80 lawyers led by a former President of the Nigerian Bar Association, NBA, Chief Wole Olanipekun, SAN, drew attention of the panel to the four interim injunctions against his trial. Olanipekun drew attention of the tribunal to two separate orders from the Federal High Court in Abuja, another injunction from a High Court of the Federal Capital Territory, as well as a retraining order from the National Industrial Court. He further notified the tribunal that the Abuja Division of Court of Appeal had on a request by the Attorney General of the Federation, Mr. Abubakar Malami, SAN, fixed Thursday to hear an appeal the CJN lodged against decision of the panel to hear his motion challenging jurisdiction of the CCT, alongside the motion FG filed for him to vacate his office. Olanipekun argued that it would amount to an act of judicial rascality and irresponsibility, for the CCT to proceed with the trial, having been notified of all the interim orders and the pending appeal. He therefore urged the Mr. Umar's led CCT panel to show respect to established precedents and the judicial heirachy, by adjourning the trial sine-die. FG's lawyer, Alhaji Aliyu Umar, opposed the request, insisting that the CCT was not under legal compulsion to adhere to any injunction from either a high court or the NIC. Umar contended that only the Court of Appeal has supervisory powers over the CCT and not the High Court or the Industrial Court. FG told the court that it would have ordinarily applied for a warrant of arrest to be issued against the CJN over his refusal to appear for trial despite the fact that he was personally served with a summon on January 14 to appear before the tribunal for arraignment. "This Tribunal is a unique creation of the law. We want to also clear a misconception concerning the motion we filed. Our application is not for removal of the CJN, but for him to step aside as both the CJN and Chairman of the National Judicial Council, pending the determination of allegations against him. "We have the right under Paragraph 6(6) of the Code of Conduct Tribunal Practice Direction to apply for warrant of arrest, but I will not do so because the defendant is the Chief Justice of the Federation. "On the request for adjournment sine-die, I will leave that to the discretion of this tribunal. I will however seek for an interim order with respect to our application", FG's lawyer submitted. Olanipekun countered him, insisting that the tribunal at that stage, lacked the powers to issue any interim injunction in the matter. "In fact the only jurisdiction open to the tribunal at this stage is for it to determine whether or not it has the jurisdiction", Olanipekun added. After about one hour stand-down, the CCT panel reconvened to deliver a two-to-one split decision that rejected the CJN's application for indefinite adjournment.